Townland record details , townlands are the smallest official land division but many contain locally used placenames . Area 515 A. 0 R. 6 P.
Census of Ireland 1901 Head of Household (B1). Honor Corbett Honor Corbett Private dwelling with 2 rooms. Pat Corbett Pat Corbett Private dwelling with 2 rooms. Michael Langan Michael Langan Private dwelling with 2 rooms. Richard Corbett Richard Corbett Private dwelling with 2 rooms. John Donlon John Donlon Private dwelling with 2 rooms. Bridget Roache Bridget Roache Private dwelling with 2 rooms. James Fuery James Fuery Private dwelling with 2 rooms. Thomas Corbett Thomas Corbett Private dwelling with 2 rooms. Click on the Griffiths Valuation Page # 156 to see a list of tenants with plot numbers to match the Griffith map. 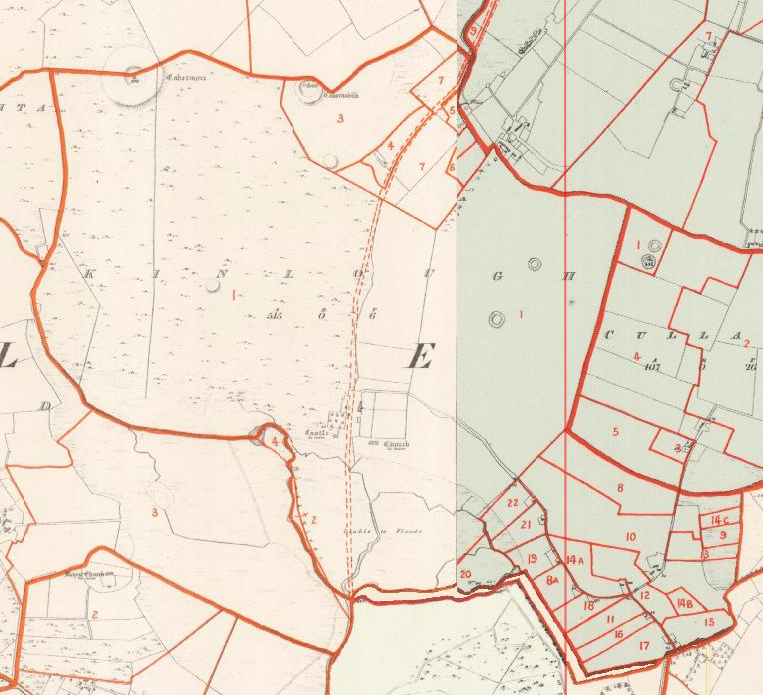 Griffith’s final published valuation of South Mayo is dated circa 1854 due to the fact that Lady De Clifford is listed as owner of Dalgan and Patrick Kirwan owned it until sold in 1853 on account of the Encumbered Estates Act.The original surveys of Shrule were carried out in late 1838 ( from surveyors letters ). The map has each renters plot numbered and recorded in the Valuation book so the exact location of your ancestors plot can be ascertained. Click on the Griffiths Valuation Ballinrobe Page # 156 to see a list of tenants with plot numbers to match the Griffith map. Field Name Book description from 1838/1839 noted by the surveyors who produced the O.S maps originally. Cionn Locha , head of the lake. Kinlagh : Inq. temp. Jac. I.
E. by the tds. Of Cloonbanaun and Cullagh; N. by the td. of Brodullagh South; and W. by the td. of Toorard. It contains 515a. Or. 6p., and is the property of Thomas Reddington, Esq. Agent, Michael Dowdall, Esq. No leases are given: The soil is a light. clay, with a great deal of limestone. The tenants are all Catholics. There are in this townland 6 ancient forts, the ruins of an old castle, and an old church in ruins.